The numbers in Bryce DeSpain’s upbringing aren’t big. He prefers it that way. His hometown in rural downstate Illinois is 6,000 people max. There are four stoplights in town, two of them installed since he was born, and one Walmart in the entire county. The big numbers he does prefer are high RBIs. 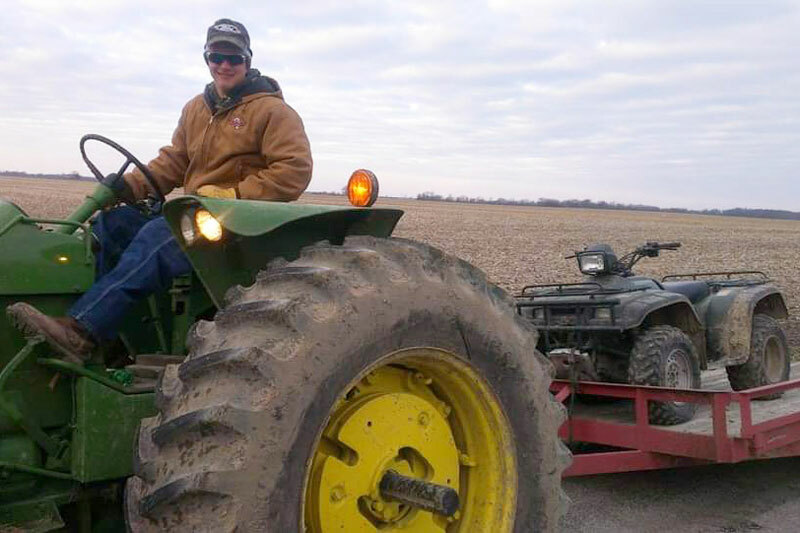 In October of Bryce’s senior year of high school, he was working on his family’s farm when a call from a 630 number popped up on his phone. Puzzled, he answered. 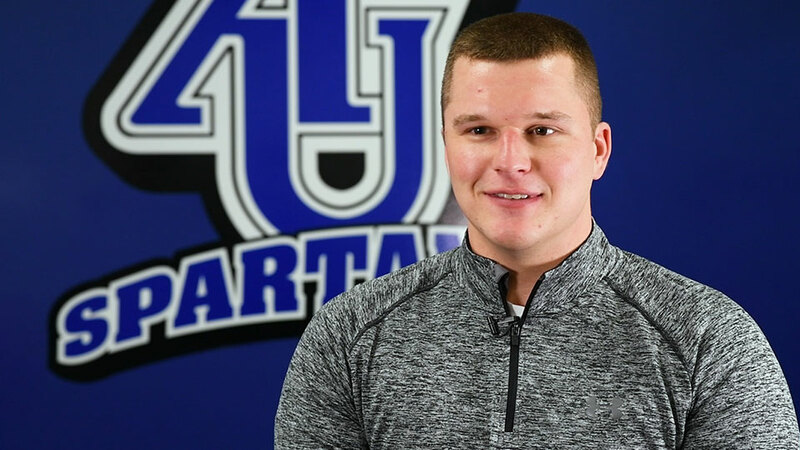 It was Jordan DeGeorge, the assistant baseball coach at Aurora University, who told him that school scouts had seen him play and wanted to know if he was interested in sitting down to talk about becoming a Spartan. Bryce is confident in his subsequent decision to take Jordan up on his offer and make the drive for a visit. There are many reasons for that, but the human one is the most important. Another reason for Bryce’s enthusiasm for AU is the campus itself, which, not coincidentally, reminds him of the friendly, intimate feel of his hometown. 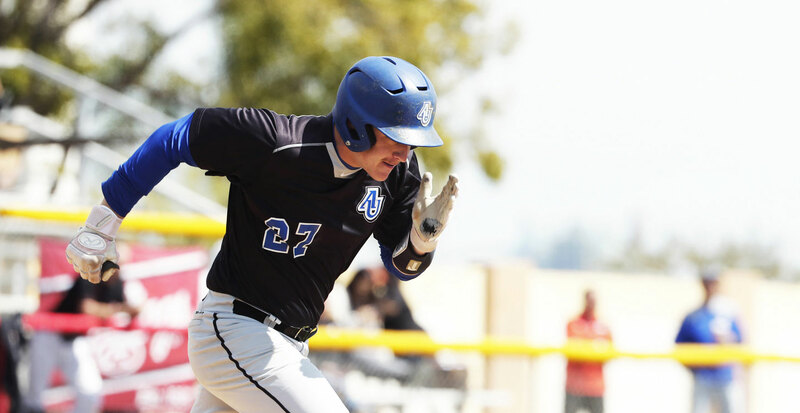 A number of schools of different sizes had recruited him to play baseball. He had visited some with 15,000 or 20,000 students. That just didn’t appeal to him. He knew that he would be merely another anonymous student. As a career, baseball was the dream. Bryce had played in national tournaments (where he first came to the attention of the AU staff). He had even coached in national tournaments. But a career as a professional baseball player seemed out of reach. Following a path into health science while still playing on AU’s baseball team was a more reasonable choice. Osteopathy and chiropractic medicine sounded interesting. He consulted about it with some of his professors, too. One, Miriam Ojaghi, helped set him up in a job in a chiropractor’s office. By his second semester at AU, he was working with the doctors there. For Bryce, though, the excitement of surgery was missing from the life of a chiropractor. The only problem with surgery, as he discovered, was that he had an aversion to blood and that the sight of it made him feel queasy. He thought it was something he could get past, even learn to ignore, so he could explore a career path as a surgeon. That aversion, however, took on a whole new significance during his studies. In an anatomy class, an animated video on surgery had an impact on him — and not in a good way. Assistant professor of biology James Cain suggested Bryce take an independent study course, part of which involved animal dissection. The idea was that the experiment would be about pure anatomy, as opposed to the messiness of surgery. When it came down to it, though, the “less gore and more science,” as Bryce puts it, didn’t change the outcome. His negative reaction to blood was still there. Health science was out. Once again, he looked to faculty for guidance. Coach Stevens was supportive of a change in major and sent Bryce to knock on the door of Mark Walsh, associate professor of physical education, who had helped create the sport management major at AU. Bryce had begun thinking a career in baseball might be a possibility after all, maybe as a coach or general manager. Mark gave his thumbs-up as well. So Bryce pivoted to become a sport management major. College life was looking pretty good. Classes and baseball — along with activities such as volunteering and gaining management skills in the Leadership Education And Development program — helped fill his time. But hard reality stepped up to bat once again. 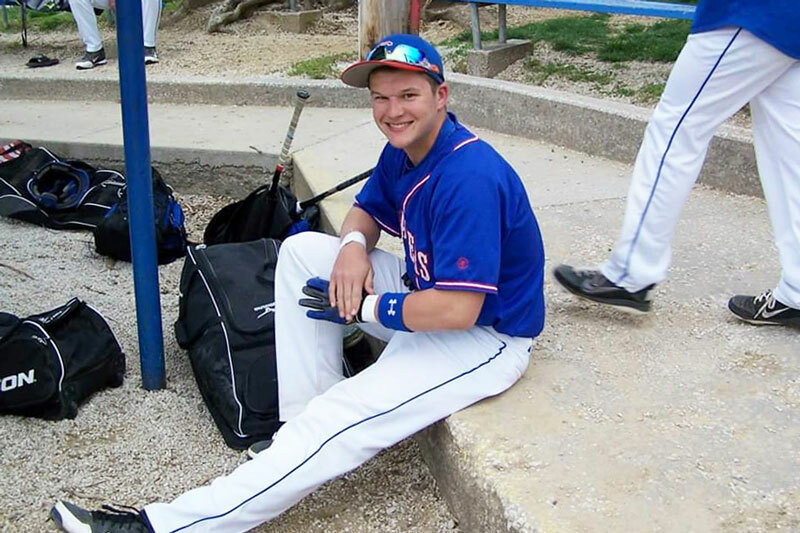 For several years beginning in high school, Bryce had been experiencing hip pain. Catcher is his position, and his injuries had sidelined him from that for a bit, but as a hardy high schooler, he didn’t let it bother him. “I’ve broken 17 bones, so I’m kind of like ‘eh, it’ll be fine, it’s no big deal,’” he says. But he also adds that college ball is a “completely different animal” than high school ball. It’s much more demanding. Eventually, the pain grew enough to prevent him from being able to catch. Bryce and Coach Stevens had some frank discussions about the student-athlete’s future as a player. The coach was adamant that Bryce have a valuable college baseball experience. He placed Bryce at first base, but that didn’t provide much relief from pain. So he became a designated hitter, even playing in a conference championship. Bryce knew, however, he had to see a doctor about a more permanent solution. Ironically, what was needed was Bryce’s old nemesis — surgery — except he would be undergoing it, not performing it. An orthopedic surgeon explained that the cause of all this pain was too much high school baseball. Bryce had spent so much time squatting as a young ball player that his bones developed abnormally. “I grew wrong, basically,” he says casually. The growth plates in his hips were damaged, and neither the balls of his femurs nor his sockets were round like they’re supposed to be. He spent five hours on the table, with the surgeon performing multiple procedures to correct his hips. Months of physical therapy followed. But he still couldn’t play. 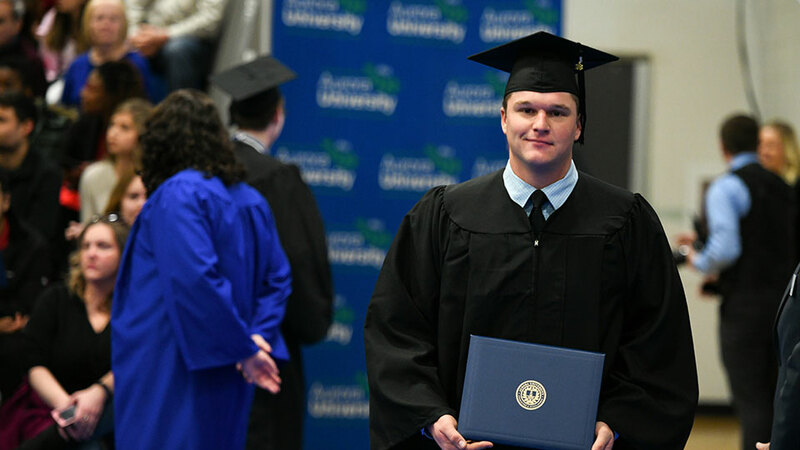 Bryce graduated in 2018, during AU’s first-ever December Commencement. For now, he is putting his experience as a recruiting liaison to good use. He has joined the AU staff as a member of the admissions team, where he’s talking to students about AU and helping them determine if the AU experience is a good fit for them. As an amiable, gregarious type of person, he’s a natural fit for the job. Given his background, though, he hasn’t ruled out working in baseball professionally at some point. Based on his sport management education, he knows what has to happen to make it all come together, from organizing concessions to managing the grounds crew. Whatever happens, he’ll always be tied to AU. He’s thinking about working toward an MBA in the school’s Plus One program to further strengthen his management skills. 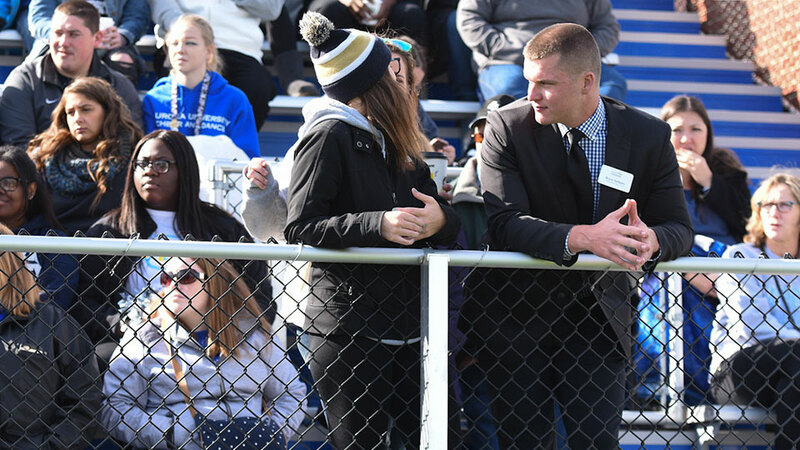 But in a bigger sense, his years at AU have been about the people he’s met along the way — the same thing that drew him in the first place.